Sgurr A' Mhaoraich is a large mountain on the N shore of Loch Quioch and overlooking Kinloch Hourn. From the S it appears as a grassy mountain of easy to moderate slopes but it's N face is steep and craggy. 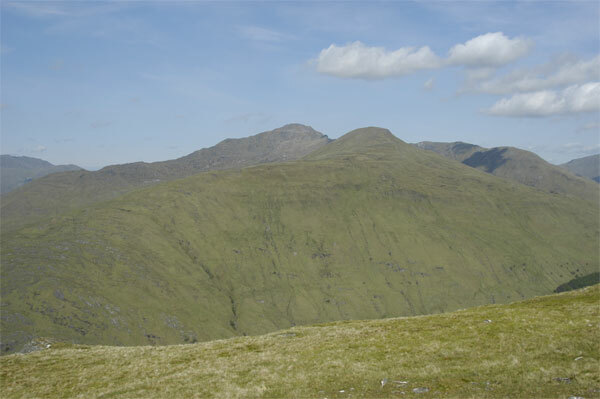 From the summit, ridges run S to a minor top (656m), W to Sgurr Mhaoraich Beag, N to Am-Bathaich, and E to Sgurr Coire nan Eiricheallach turning S to Bac nan Canaichean where a path ascends from the lochside. A path ascending through Coire nan Eiricheallach gives acces to the E slopes of the S ridge. 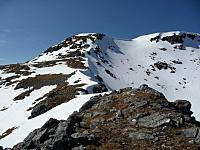 The N ridge leads down to col from where a descent E leads to a path in Coire a' Chaorainn. Sgurr a' Mhaoraich from the east ridge; 17th May 2010. Sgurr a` Mhaoraich taken from Sgurr Coire nan Eiricheallach. 11 April 2010. Sgurr a' Mhaoraich from the Sron a' Chuilinn ridge of Gleouraich. 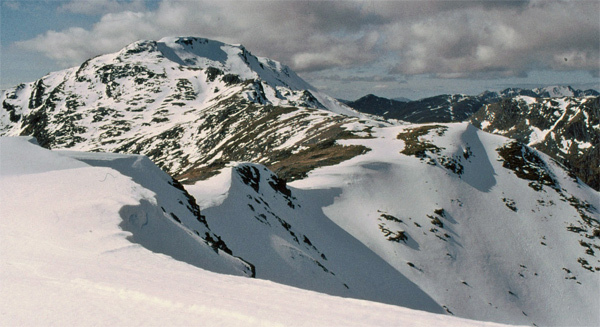 Sgurr a' Mhaoraich from Sgurr Coire nan Eiricheallach; April 2001. 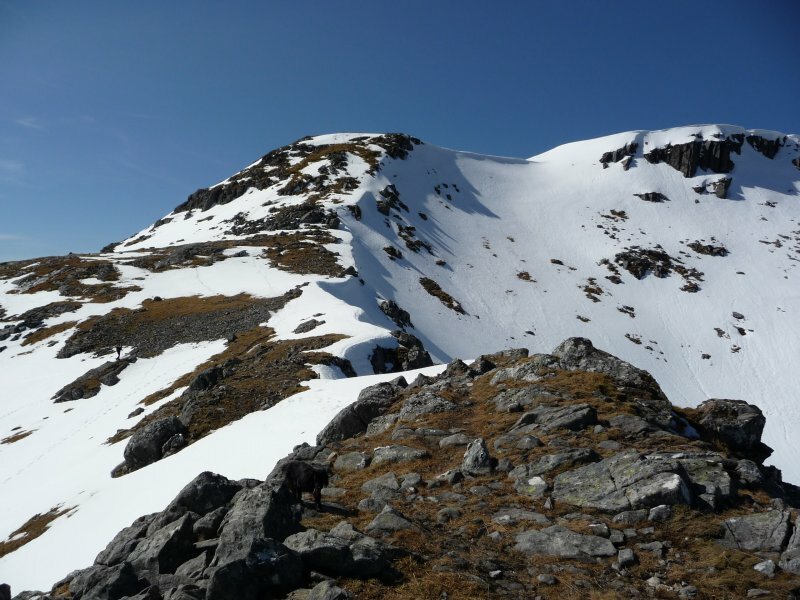 The summary information of one or more ascent routes that include Sgurr A' Mhaoraich. 1 1089 m 13.70 km 5 hrs Sgurr A' Mhaoraich Moderate route with some scrambling and narrow rocky ridges. 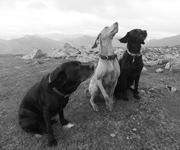 Left to right: Maura, Skye & Jorja at the summit of Sgurr a' Mhaoraich. June 2015. There may be a chap with a biscuit just out of shot. 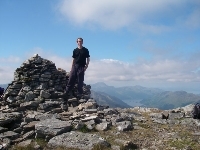 Me at the top of Sgurr a Mhaoraich on 23rd September 2012. 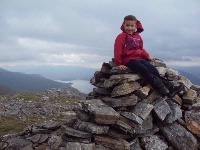 Grandson Reo (6) ....starting his munro bagging career! Post a few words about Sgurr A' Mhaoraich or read what others have had to say. Climbed with a party of 5 on 2/9/06. Excellent stalkers path encourages speedy start and quickly reach summit (Good signage re stalking requirements) descended to N bealach and out via Am Bathaich and descent via grassy wet stalkers path to meet track back to loch Quoich. Took a leisurely 6hrs.